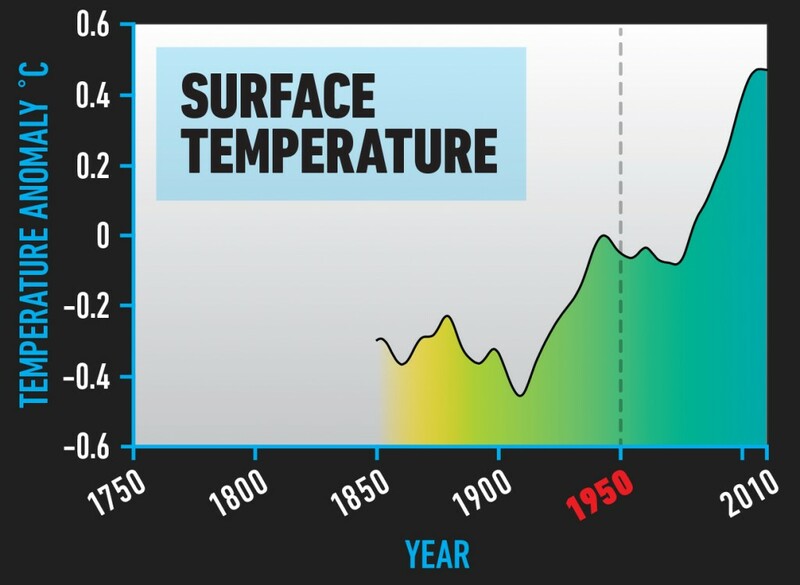 From the impact of the industrial revolution to today’s rapid urbanisation and the climate trends that made 2014 the warmest year on record, these charts are a snapshot of our changing world. They testify to a great acceleration of humanity’s impact on our planet and the “new global context” that leaders operate in. In a single human lifetime, Earth has moved to a quantifiably new state. The global population is now about 7.2 billion people. But we have now reached “Peak Child. The number of children in the world is no longer growing, which means population growth will begin to stabilise. (Steffen et al 2014) Global population data according to the HYDE (History Database of the Global Environment) database. Data before 1950 are modelled. Data are plotted as decadal points. SOURCES: HYDE database 2013; Klein Goldewijk et al. 2010. Despite emerging economies becoming the global production engine, the bulk of economic activity, and the lion’s share of consumption, remains largely within wealthy nations. Global real GDP (Gross Domestic Product) in year 2010 US dollars. Data are a combination of Maddison for the years 1750 to 2003 and Shane for 1969-2010. Overlapping years from Shane data are used to adjust Maddison data to 2010 US dollars. SOURCES: Maddison 1995; M. Shane, Research Service, United States Department of Agriculture (USDA); Shane 2014. 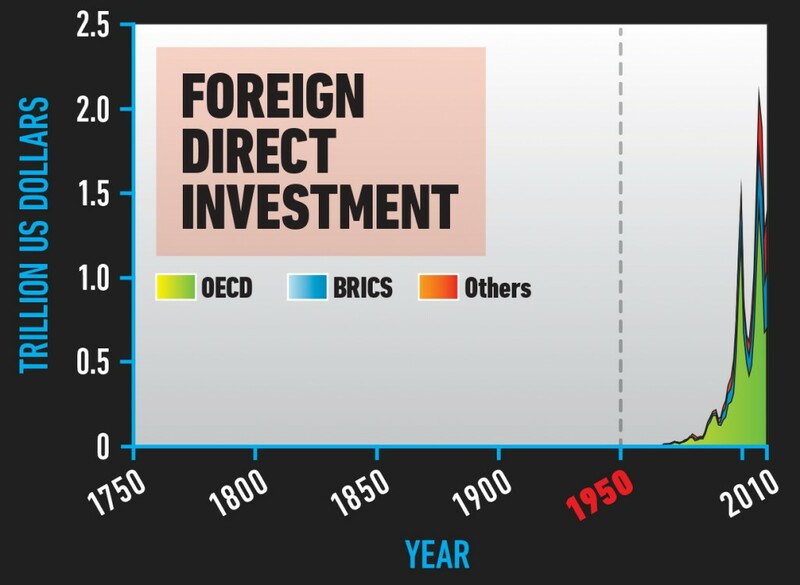 Global foreign direct investment in current (accessed 2013) US dollars based on two datasets: IMF (International Monetary Fund) from 1948 to 1969 and UNCTAD (United Nations Conference on Trade and Development) from 1970 to 2010. SOURCES: IMF 2013; UNCTAD 2013. 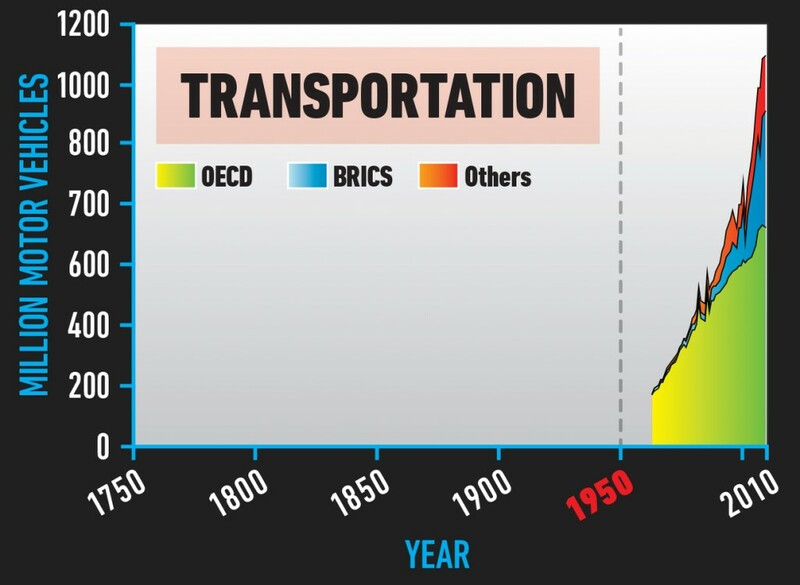 Fossil fuels – coal then oil – powered the Industrial Revolution. The availability of cheap, abundant energy changed the lives of those with access. It changed the trajectory of those nations able to exploit this new energy supply. And it changed our planet through emissions of greenhouse gases, deforestation, industrial crop production and transport. 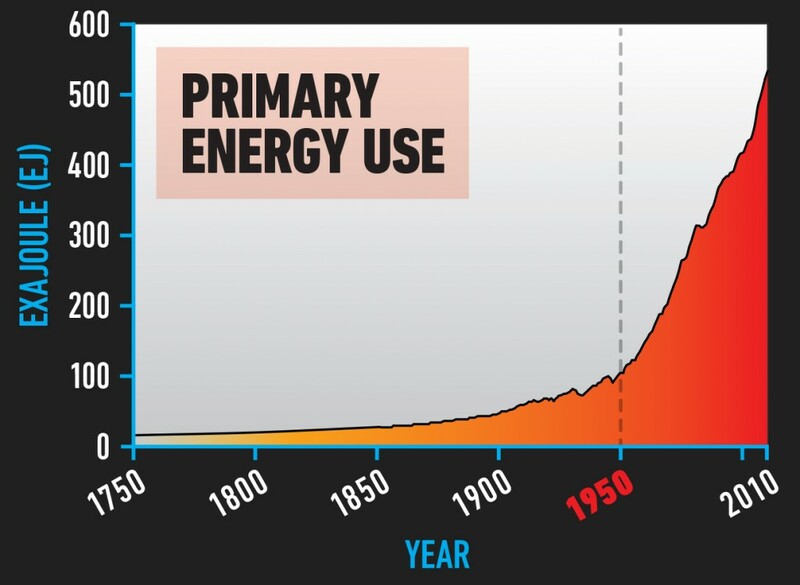 World primary energy use. 1850 to present based on Grubler et al. 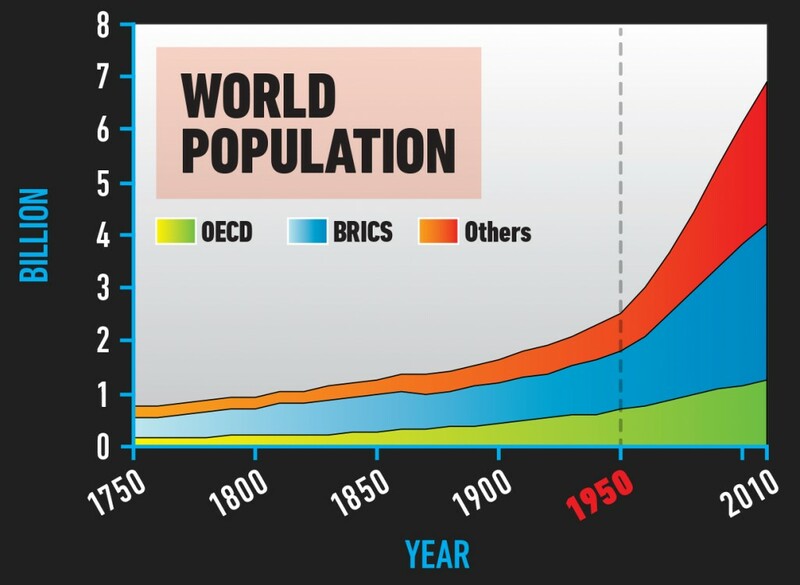 2012; 1750-1849 data are based on global population using 1850 data as a reference point. SOURCES: A. Grubler, International Institute for Applied Systems Analysis (IIASA); Grubler et al. 2012. Tens of thousands of large dams built over the last two centuries have changed natural river flows and contributed to altering the global water cycle. Dams starve deltas of sediment. As a result, along with mining, irrigation and fossil fuel extraction, many of the world’s deltas are sinking four times faster than sea level is rising. 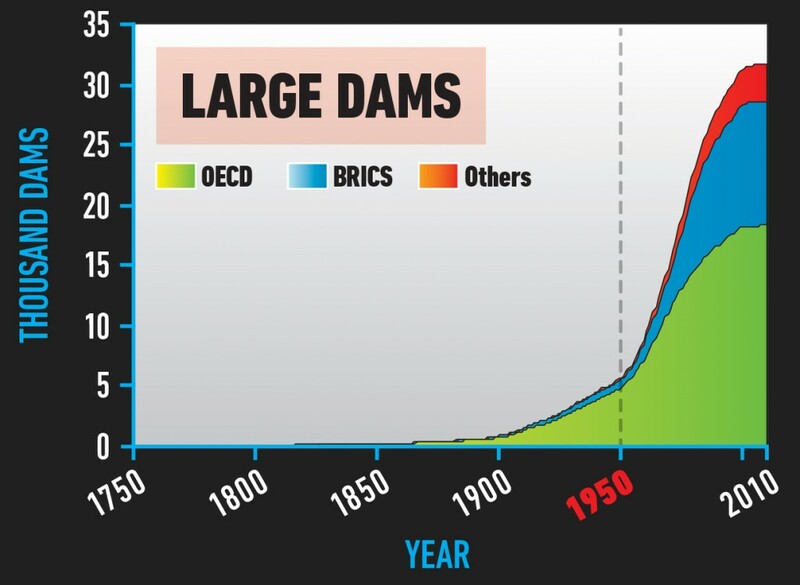 Global total number of existing large dams (minimum 15 m height above foundation) based on the ICOLD (International Committee on Large Dams) database. SOURCE: ICOLD database register search. Purchased 2011. Irrigation for food production and other agriculture is one of the greatest pressures on freshwater resources. Agriculture accounts for about 70% of global freshwater withdrawals and demand for meat drives up demand for water. Water is a defining issue of our age. 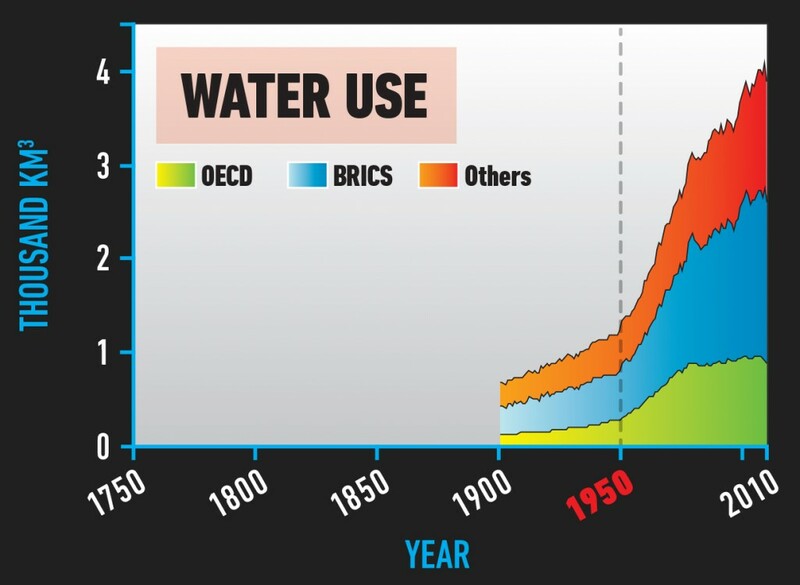 Global water use is the sum of irrigation, domestic, manufacturing and electricity water withdrawals from 1900 to 2010 and livestock water consumption from 1961 to 2010. The data are estimated using the WaterGAP model. SOURCE: M. Flörke, Center for Environmental Systems Research, University of Kassel; Flörke et al. 2013; aus der Beek et al. 2010; Alcamo et al. 2003. Modern agriculture depends on fertilizers such as phosphorus and nitrogen. 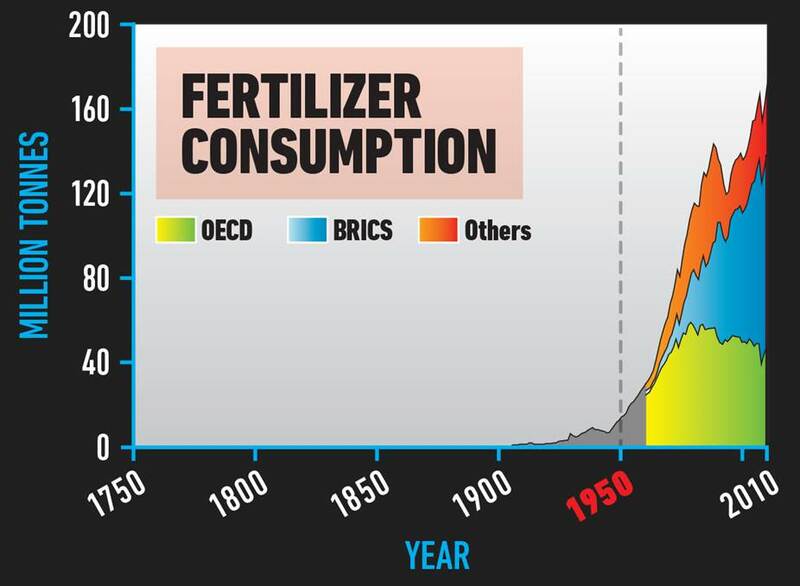 It is estimated that the industrial production of nitrogen-based fertilizers sustains perhaps one-third of the total human population. Many people need more fertilizers, especially in Africa, even though Africa is the largest exporter of phosphate rock. 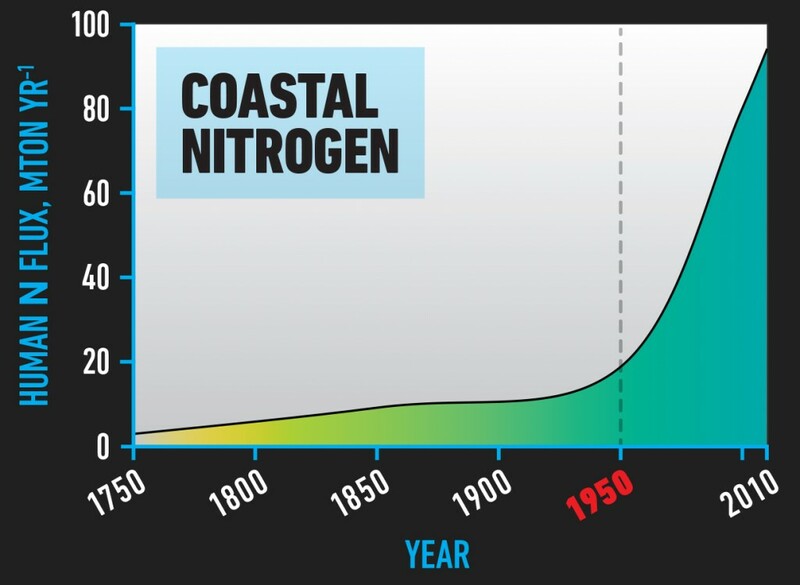 Conversely, overuse of fertilizer leads to major environmental problems such as marine dead zones. Global fertilizer (nitrogen, phosphate and potassium) consumption based on International Fertilizer Industry Association (IFA) data. SOURCES: Olivier Rousseau, IFA; IFA database. Paper is one of the major global commodities like corn, cotton, coffee, copper, oil and sugar. It is part of modern life, even in the digital era. About 50% of paper and cardboard is used for packaging. The next largest market is printing. The global market for paper and timber puts pressure on developing countries to destroy forests. 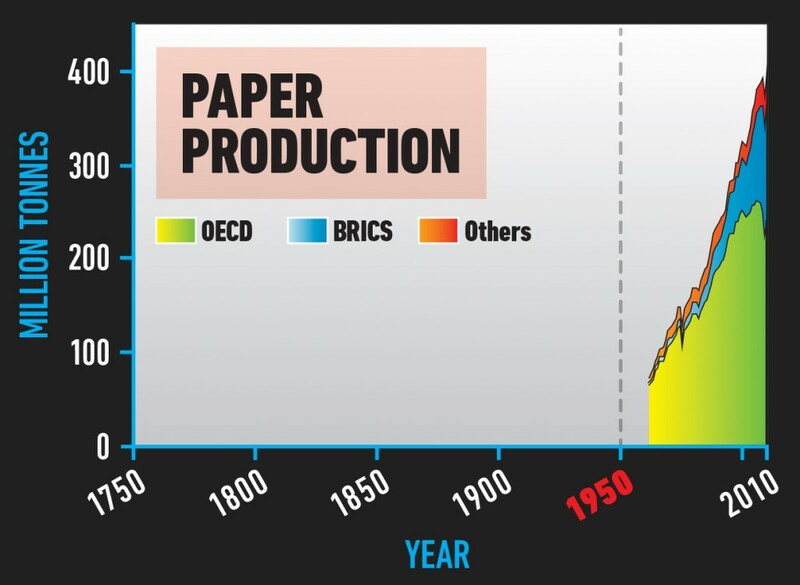 Global paper production from 1961 to 2010. SOURCES: Based on FAO online statistical database FAOSTAT. Around 2008 humanity passed a historic milestone: over 50% of the global population now live in urban areas. On current trajectories there will be more urban areas built during the first three decades of the 21st century than in all of previous history combined. But cities are the action arms of civilization. They are dynamic hotbeds of innovation. This is where good ideas scale fastest. Global urban population data according to the HYDE database. Data before 1950 are modelled. Data are plotted as decadal points. The phenomenal growth in the number of motor vehicles on the roads shows no signs of slowing. This is one part of the global transportation system. People and products now sweep around the planet via a hyper complex network of interconnected roads, railways, shipping lanes and aircraft routes. Foreign travel enriches lives and boosts economies, but to continue, a low-carbon revolution is essential to live within planetary boundaries. Global number of new motor vehicles per year. From 1963 to 1999 data include passenger cars, buses and coaches, goods vehicles, tractors, vans, lorries, motorcycles and mopeds. Data 2000-2009 include cars, buses, lorries, vans and motorcycles. SOURCES: IRF (International Road Federation) 2011. 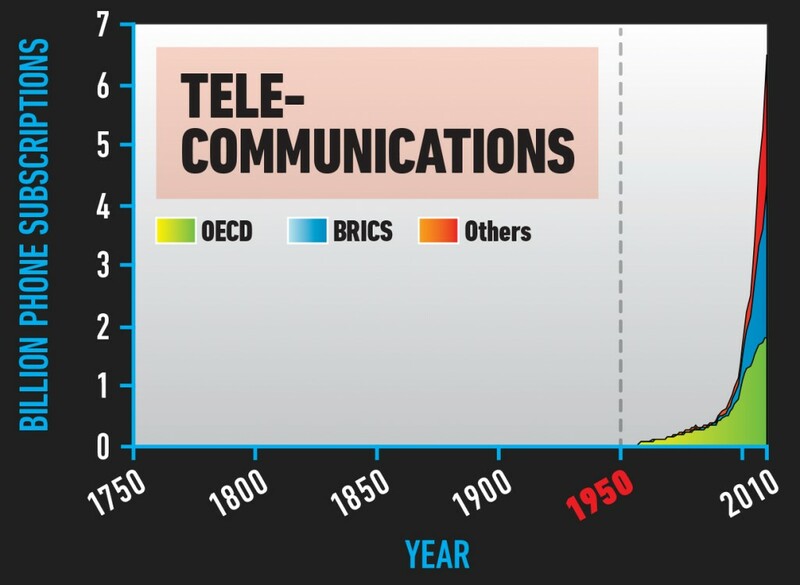 The world has experienced astonishing telecommunications growth in recent decades. There are now 7 billion mobile phone subscriptions and 3 billion people – 40% of the world population – have internet access. In the next decade this remarkable growth is set to continue as Africa and Asia leapfrog over obsolete technologies like land lines. Global sum of fixed landlines (1950-2010) and mobile phone subscriptions (1980-2010). Landline data are based on Canning for 1950-1989 and UN data from 1990-2010 while mobile phone subscription data are based solely on UN data. 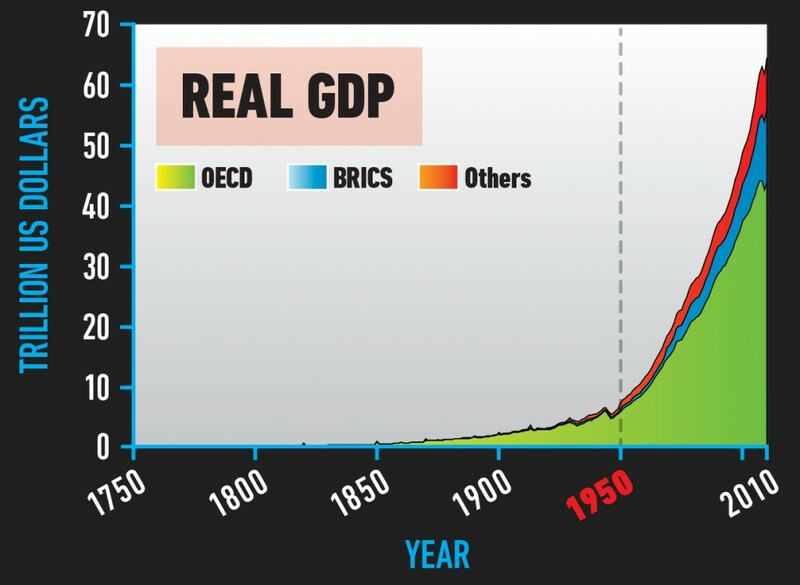 SOURCES: Canning 1998; United Nations Statistics Division (UNSD) 2014. Many in developed nations think nothing of travelling thousands of kilometers for a week’s holiday or even a weekend. In a single generation, commercial airlines have transformed how many travel, and experience our planet. 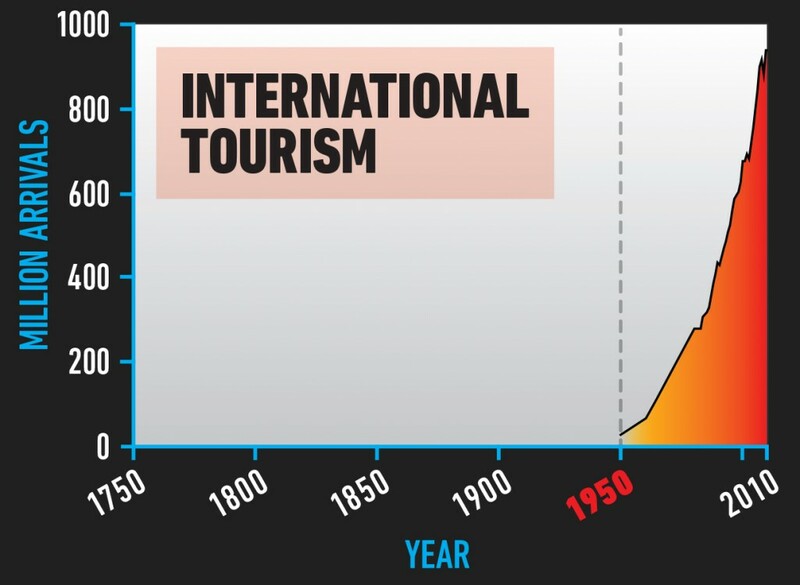 Tourism has risen exponentially and is a key feature of globalization. Lighter materials and better engine technologies are making aircraft more fuel efficient, but this is outweighed by increasing demand for flights. Number of international arrivals per year for the period 1950-2010. SOURCES: Data for 1950-1994 are from UNWTO (United Nations World Tourism Organization) 2006 and data for 1995-2004 are from UNWTO 2011, data for 2005-2010 are from UNWTO 2014. Deforestation and emissions from fossil fuels are altering the concentration of the greenhouse gas carbon dioxide in the atmosphere. Concentrations have increased more than 40% since 1750. This is causing Earth to warm rapidly. Emissions may have a destabilizing effect on the climate. The more we emit, the greater the risk to vulnerable societies and even our global civilization. Politicians have agreed to try to limit warming to two degrees Celsius above the global temperature in 1750. But even this carries significant risk. Carbon dioxide from firn and ice-core records (Law Dome, Antarctica) and Cape Grim, Australia (deseasonalised flask and instrumental records); spline fit. SOURCE: D. Etheridge CSIRO, Australia; Etheridge et al. 1996; MacFarling Meure et al. 2004 and 2006; Langenfelds et al., 2011. 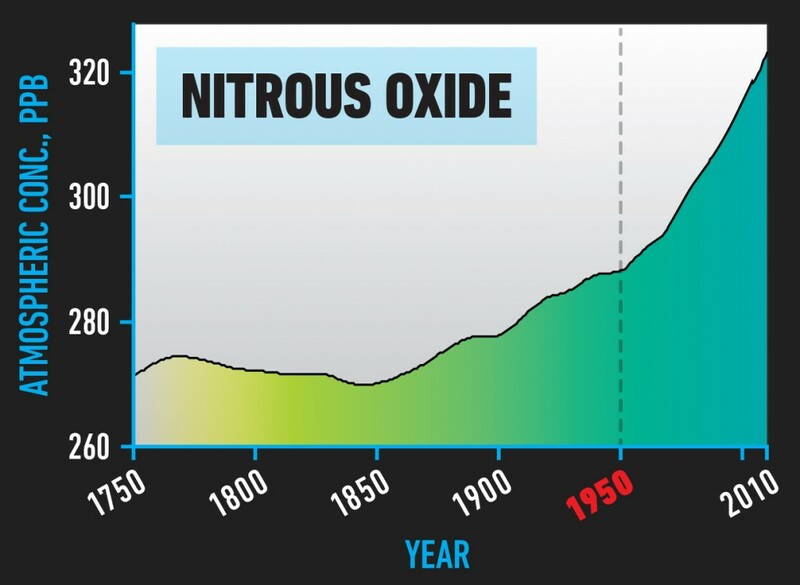 Nitrous oxide is 300 times more potent as a greenhouse gas than carbon dioxide. 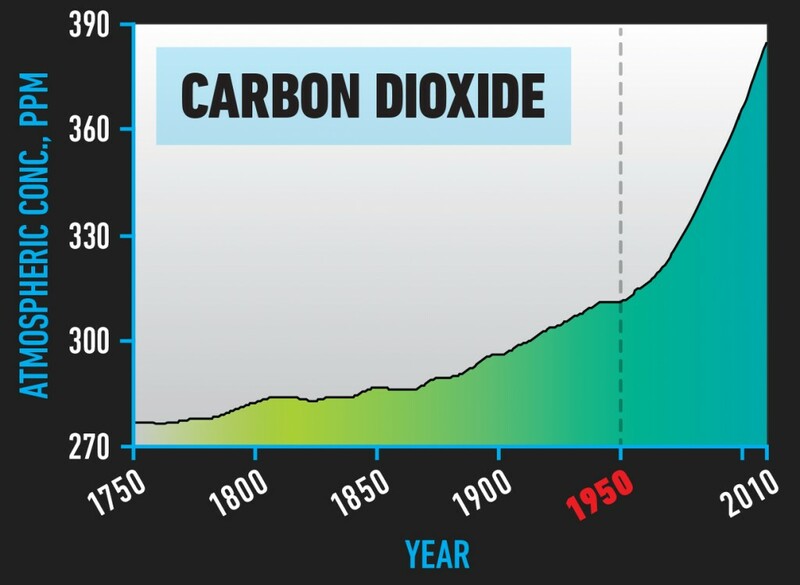 Its concentration in the Earth’s atmosphere has risen dramatically since the start of Industrial Revolution. The main sources are agriculture, livestock production and burning fossil fuels. Nitrous oxide from firn and ice core records (Law Dome, Antarctica) and Cape Grim, Australia (deseasonalised flask and instrumental records); spline fit. SOURCE: D. Etheridge CSIRO, Australia; MacFarling Meure et al. 2004 and 2006; Langenfelds et al., 2011. Methane is a greenhouse gas that is about 21 times more potent than carbon dioxide. 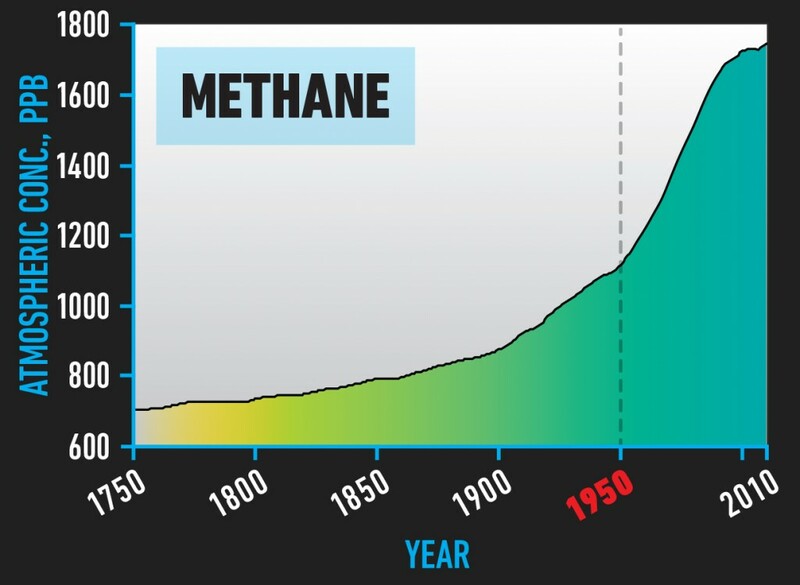 Since the start of the Industrial Revolution, methane in the atmosphere has more than doubled from around 750 parts per billion to about 1850 parts per billion in 2010. Methane from firn and ice-core records (Law Dome, Antarctica) and Cape Grim, Australia (deseasonalised flask and instrumental records); spline fit. 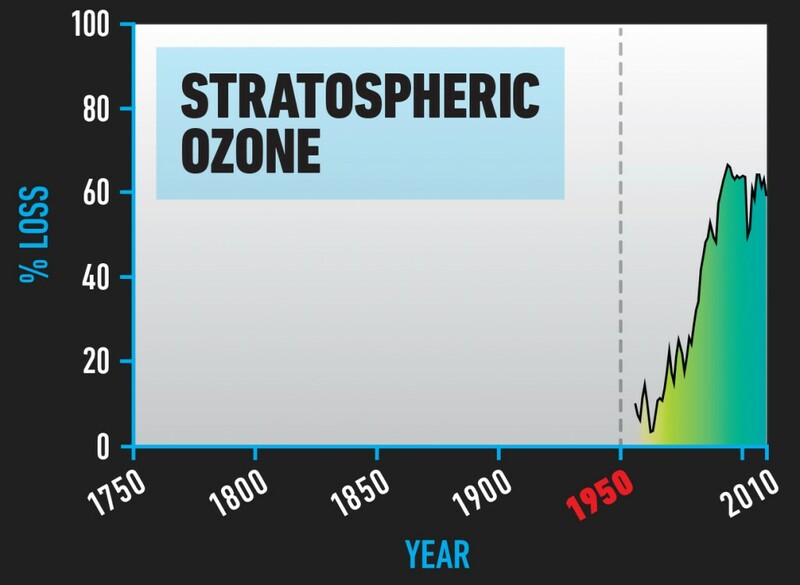 The ozone layer high in the upper atmosphere protects life on Earth from the sun’s ultraviolet radiation. Manmade CFCs destroy ozone. In 1985, researchers made one of the most important discoveries in the history of science – a giant hole had appeared in the ozone layer above Antarctica. Nations agreed to ban these harmful chemicals. Recently, the ozone hole stopped expanding and there may even be signs of a recovery. Maximum percentage total column ozone decline (two-year moving average) over Halley, Antarctica, during October, using 305 DU, the average October total column ozone for the first decade of measurements, as a baseline. SOURCE: Data provided by J. D. Shanklin, British Antarctic Survey, UK. It’s official. 2014 was the warmest year on record. In the short term this means wet areas are likely to get wetter and dry areas drier, causing hardship and affecting infrastructure. In the long term, rising temperatures will threaten vulnerable societies, crop production, coastal cities. Greenhouse gas emissions may push the climate – or parts of the system such as ice sheets, rainforests or ocean circulations – past thresholds, where the behavior becomes unstable. Global surface temperature anomaly (HadCRUT4: combined land and ocean observations, relative to 1961-1990, 20 y Gaussian smoothed). The oceans are big – 70% of the Earth surface. Scientists often thought they were just too big for humans to really affect them very much. 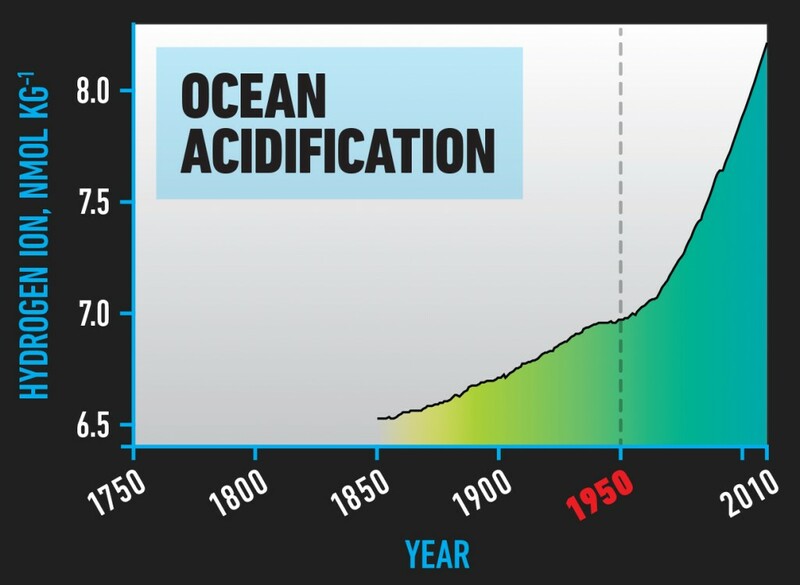 But then they discovered that carbon dioxide emissions were changing the chemistry of the oceans, making them more acidic. The rate of change may be faster than at any other time in the last 300 million years. Corals and shellfish are already affected. Ocean acidification expressed as global mean surface ocean hydrogen ion concentration from a suite of models (CMIP5) based on observations of atmospheric CO2 until 2005 and thereafter RCP8.5. SOURCE: James Orr, LSCE/IPSL, France; Bopp et al. 2013 and IPCC Fifth Assessment Report, Working Group 1, Chapter 6 (Ciais et al. 2013). 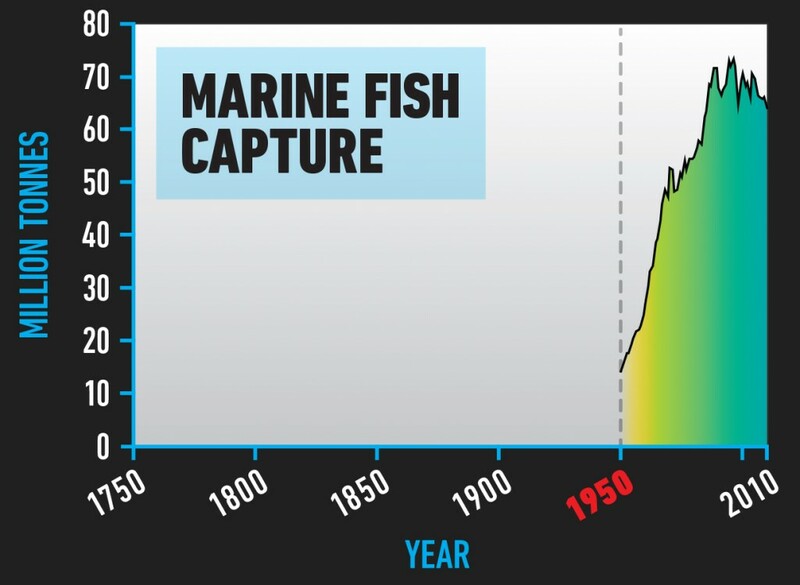 For many decades marine fish capture increased dramatically with an average growth rate greater than population growth. It has levelled off in the last decade, but this is largely because fish stocks are depleted. The industry is shifting to aquaculture. Global marine fishes capture production (the sum of coastal, demersal and pelagic marine fish species only), i.e., it does not include mammals, molluscs, crustaceans, plants etc. There are no FAO data available prior to 1950. SOURCE: Data is from the FAO Fisheries and Aquaculture Department online database (FAO-FIGIS 2013). 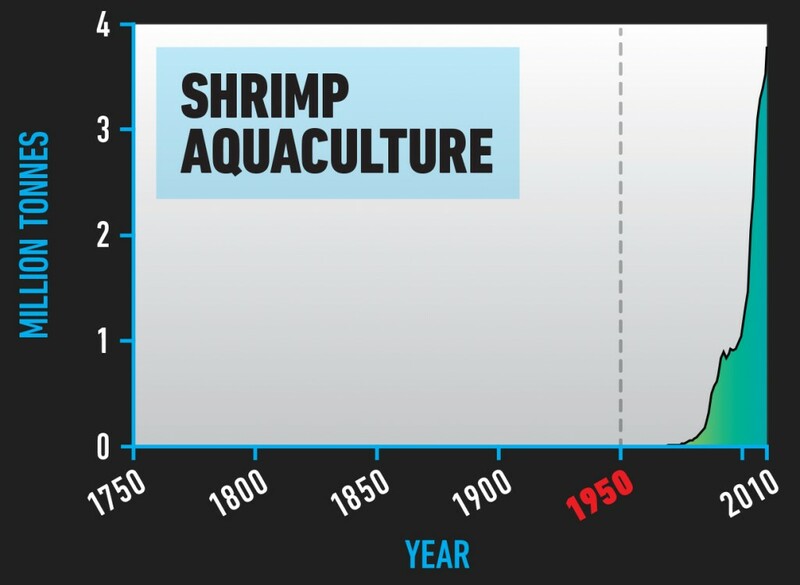 Aquaculture is an indicator of how coasts are changing. Mangroves and other natural protective sea barriers are being replaced with vast stretches of aquaculture. Around 89% of world aquaculture is in Asia, and this is dominated by China. Global aquaculture shrimp production (the sum of 25 cultured shrimp species) as a proxy for coastal zone modification. SOURCE: Data is from the FAO Fisheries and Aquaculture Department online database FishstatJ (FAO 2013). It is estimated that industrial fertilizers are responsible for one third of the global population. However, in many places, farmers use more fertilizer than they need. It runs off the land into waterways and coastal zones causing vast dead zones. Fertilizers are essential to feed the world population, but to feed seven billion they need to be managed carefully to avoid unintentional consequences. Model-calculated human-induced perturbation flux of nitrogen into the coastal margin (riverine flux, sewage and atmospheric deposition). SOURCE: Mackenzie et al., 2002. The rainforests are precious ecosystems essential to the functioning of our planet. They harbor a rich diversity of life, they drive weather systems and they absorb carbon dioxide. There is a real risk rainforests like the Amazon may cross tipping points leading to widespread collapse of the rainforest environment and a move to more savannah-like conditions. 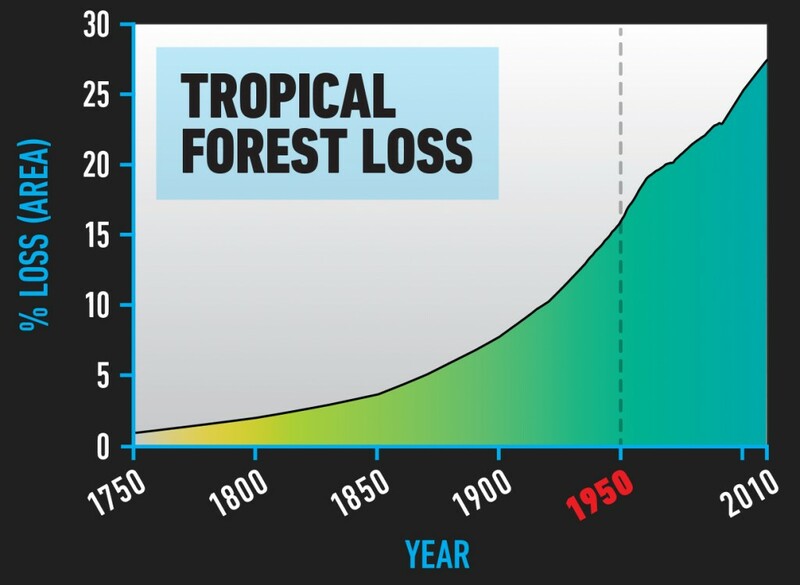 Loss of tropical forests (tropical evergreen forest and tropical deciduous forest, which also includes the area under woody parts of savannas and woodlands) compared with 1700. SOURCE: Julia Pongratz, Carnegie Institution of Washington, Stanford, US; Pongratz et al. 2008. AD 1700 to 1992 is based on reconstructions of land use and land cover (Pongratz et al. 2008). Beyond 1992 is based on the IMAGE land use model. Humanity uses an area the size of South America to grow crops and an area the size of Africa for livestock. There are now very few truly wild areas left. Even unmanaged woodlands or verges are within a mosaic of managed land. Better agricultural technologies and less easily available fertile land means this curve is beginning to bend in a more positive direction. Increase in agricultural land area, including cropland and pasture as a percentage of total land area. SOURCE: Julia Pongratz, Carnegie Institution of Washington, Stanford, US; Pongratz et al. 2008. AD 1700 to 1992 is based on reconstructions of land use and land cover (Pongratz et al., 2008). 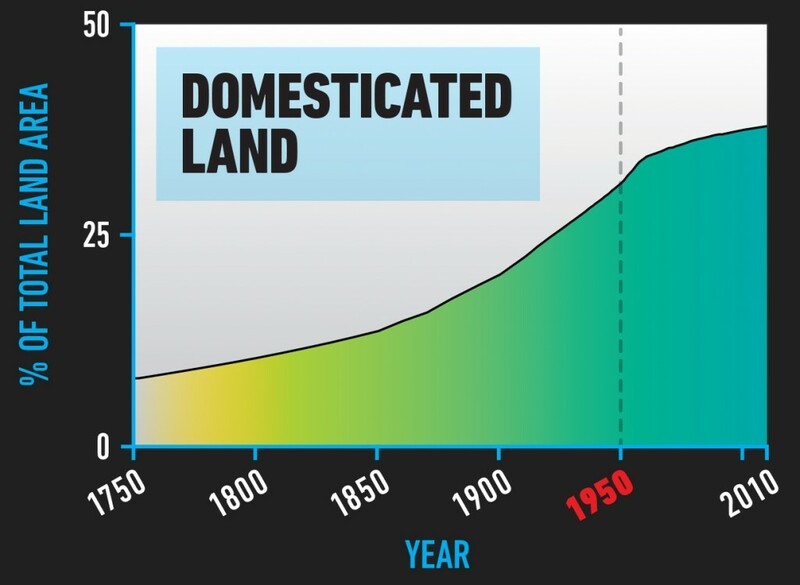 Beyond 1992 is based on the IMAGE land-use model. Thousands of species of animal, plant and microorganism are either extinct or dying out. Entire ecosystems are being destroyed. Some scientists say Earth is approaching mass extinction rates. In the past this has often been caused by a massive external event like the asteroid impact that wiped out the dinosaurs. This time, one species is responsible: humans. 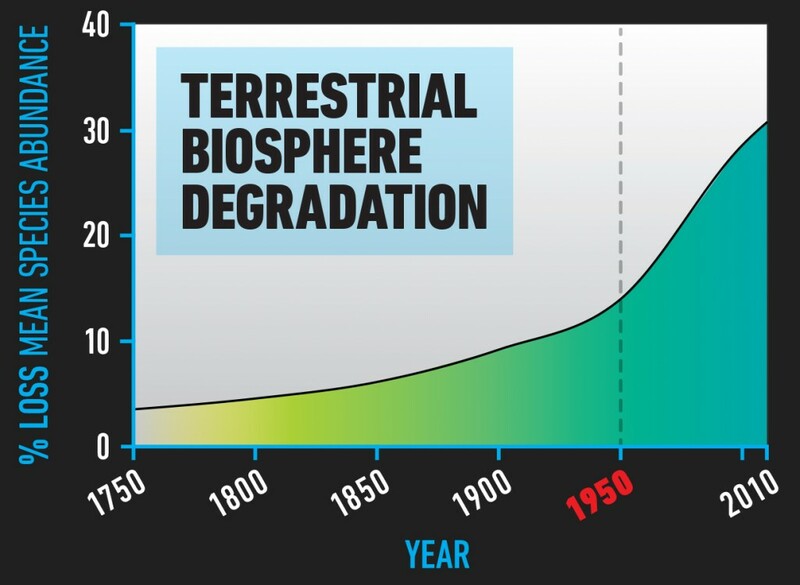 Percentage loss of terrestrial mean species abundance relative to abundance in undisturbed ecosystems as an approximation for degradation of the terrestrial biosphere. SOURCE: R. Alkemade, PBL Netherlands Environmental Assessment Agency: modelled mean species abundance using GLOBIO3 based on HYDE reconstructed historical land-use change estimates (until 1990) then IMAGE model estimates (Alkemade et al. 2009, www.globio.info, ten Brink et al., 2010). Authors: Will Steffen, Wendy Broadgate, Lisa Deutsch, Owen Gaffney, Cornelia Ludwig. Data design by Félix Pharand-Deschênes.